Because pot is being legalized in more and more states, many young people assume it must be safe. However, when used by people whose brains are still developing (up to age 25), there is an increased risk of developing a mental illness. Recent studies have shown this vulnerability, and the tragic correlation is starkly illustrated by the life of my brother, K.
K started getting high at a young age. He smoked just a little bit, almost every day, through junior high, high school, college, and graduate school. To him, it seemed like harmless fun. But within a few years after completing his higher education, he became a homeless drug addict and dealer with schizophrenia. He went to jail eighteen times. Relative to so many others, K’s story ends well. He is alive, out of jail, off the streets, and is sober. He is receiving psychiatric care. He lives in a group home where his meals and transportation are provided and his psychiatric medications are dispensed. He is alive to tell his harrowing story. To warn teenagers that what seems like harmless fun can actually ruin their lives, K and I wrote a book, A NIGHT IN JAIL, that is inspired by his experiences. Click book cover to visit the author’s website. K is 4 years older than me. Growing up, he was a vivacious, bright kid who laughed a lot. He got good grades and had friends and girlfriends. A lot of kids in the Pacific Northwest were smoking pot. I was twelve when I started. One time when I was getting high, I had an experience where I didn’t know where I was (in our family’s laundry room). I also couldn’t figure out who the “stranger” was that was getting high with me (my best friend). And this was when the THC content was several times lower than it is today. Pot was not my favorite thing to do. But it was my brother’s favorite thing. K got through high school, graduated from college with decent grades, not great, but good enough to get into a good graduate school. However, once there, he didn’t perform well in his classes or on his exams. Once he was finished with school, K found he had no job prospects in his field. Instead, K could only get low-wage, unskilled work. It was impossible to meet his monthly expenses, which included a student loan he took out in graduate school. Then a woman K knew felt sorry for him and let him live in the attic of her home. This was the 80’s and coke was on the scene. After a decade-plus of devotion to marijuana, K tossed his bong to the curb for the status and thrill of cocaine. He snorted it, he mainlined it, and then smoked it. In short order, he was broker than ever, defaulted on his student loan, and settled in with the love of his life, crack cocaine. Our family knew little of what was going on. We knew drugs were taking over his life, but we didn’t understand the full picture. (Only now, years later, am I able to flesh this out because of extensive conversations I’ve had with K.) One time, my mom, sister, and I went to visit him in the attic to see what we could do to help him. He had stacks and stacks and stacks of newspapers and trash piled up in one room, like a hoarder. In the other room, he held court with us. He was frightening. His hair and nails were long; he looked like he hadn’t bathed in a week. His whole body was filthy. He was balding on the top of his head and his clothes were scraggly. Everything about him was dark except his eyes, which were shining from his high. He wouldn’t stop talking—going from one subject to the next—and interjected his staccato speech with inappropriate outbursts of laughter. K was clear he was not going to change. Despondent and lacking any skills to handle the dexterity of a seasoned addict, we left. After several years in the attic, his sympathetic landlord lost her sympathy and asked him to leave. K was now homeless. For years, we didn’t know where he was. Sometimes he’d call from a motel or a friend’s house. We would hope he was in jail because there, at least, we knew he was safe. No one knew how many times he’d been to jail. Intermittently, over the years, our mom helped K get into several apartments, but he was always evicted and she always lost her deposit. She bought him several cars but he always somehow “lost” them. One year, our family had an intervention for him. I flew in from Los Angles so our whole family would be there. He arrived as a full-on, wild, homeless person who stunk so badly. He was wet, dirty, wasted, with purple, swollen gums that were evicting his brown teeth. To sum up the five-hour intervention, we read our letters aloud to him, we cried, and begged him to give up drugs. He claimed to be living his dream life. To add insult to injury, he thanked our parents for telling him he could do anything he wanted with his life, because they gave him the courage and the education to live this life he had chosen. He said he would go into treatment with one caveat: our parents had to pay him $10,000 a month. He had heard the Kennedy family paid their kids that much to stay clean (yes, that Kennedy family). When we balked, he refused to go into treatment, threw open the front door, and walked back out into the rain. As per the agreement with the intervention, we cut off contact with him. Tough love they call it. We didn’t know what else to do. K’s brain was obviously fried from all the drugs. Surely, he would die doing drugs and we couldn’t be part of it. We couldn’t have our own lives ruined because of his choices. Looking back, he tells me he didn’t feel like anything was wrong with him. He was just a guy who chose to live the party life. He wasn’t going to be confined by “the nine-to-five with a wife and kids.” He was born in the 60’s and wanted to live the footloose and fancy-free life. Several years later, I was married and had a family. He called me from out of the blue. He was in transitional housing in a rehabilitation program after having been in jail for the eighteenth time. I was the only one in the family with whom he hadn’t burned his bridges. His housing was coming to an end and he needed help getting a phone so he could look for work. My husband and I agreed to help him, as did our dad. After that, K and I spoke on the phone regularly. He seemed to really want to change his life. As the months passed, and his time in government housing was coming to an end, I was becoming increasingly concerned because he still had no job, no place to live, and no money to get anything. It seemed obvious he would wind up homeless and doing drugs again very soon. Eventually, he’d be sent to prison if not dead somewhere. After much calling around, I managed to find him a job opportunity that would include his own apartment. He got it together, he interviewed and he got the job! What a relief! Then after three months, he walked out of his job and his apartment and went back to living in the blackberry bushes. He called me from underneath the freeway and told me he was glad his old camp was still there. He was obviously high. He told me recently that when he had his first hit of crack after being clean for fourteen months, he laughed and laughed like a maniac. I was so angry with him. How could he throw it all away? Did he not care about the time and effort I put out to help him live a respectable, decent life? What about the rest of the family who was willing to accept him again? Was he the only person who mattered? It took several months, but after I calmed down, we started talking again. I asked a dear friend of mine whose husband owned a company in the northwest to help K get a job. She generously agreed. Following her instructions, I told K to write out a resume and to be honest about his life and what he wanted to do now that he was out of jail. K was furious. He screamed: Heidi, I was the CEO of a successful underground drug empire! I see all those men passing by me in their suits carrying briefcases, going into high-rise buildings to work in jobs that are rightfully mine! Mine! And you want me to drive a forklift? It was the first time I fully understood that his mental impairment went deeper than the immediate effects of drugs and addiction. I called my friend and thanked her for offering to help him. I could not ask anyone to hire him. After doing some research, I told K he should get psychologically evaluated for social security disability because—if he was mentally ill—he could get benefits and could afford a place to live. I reasoned he would cost the government a lot less by not being in jail or prison. I looked up all kinds of things about mental illness. We were warned by many people that getting benefits for mental illness was becoming harder and harder, and even the people who really deserved it weren’t getting it. But I was desperate. I was in LA and he was outside in Seattle, where it was cold and wet, living underneath a freeway and completely out of his mind. He needed psychiatric medication. But the law says that, unless he’s harmful to himself or other people, treatment is voluntary. I could not force him into anything. So I had to coax him. After several common-sense arguments to try to get him to see the doctor—all of which he shot down—I realized that trying to reason with a crazy person was crazy. I finally had to trick him. I told him he could “scam” the government, that his “insanity” would just be a ruse so he could finally get his fair share from The Man. In his delusional mind, this made sense to him. Months later, he showed up at his appointment with the psychiatrist. His doctor was a woman whom he trusted immediately. He said that he told her things he had never admitted to anyone in his whole life. Like he heard voices. And that he was under surveillance twenty-four hours a day. I never guessed this about him. Ever. Paranoid, I assumed. Out of touch with reality, of course. But his diagnosis of schizophrenia explained his years-long inability to see his own illness. Anosognosia is essentially when a person doesn’t recognize they are sick. It is seen in stroke victims, persons with Alzheimer’s disease, and is present in some people with schizophrenia and bipolar disorder. Luckily, he received his SSI benefits and, as I mentioned, continues to receive psychiatric treatment. He moved to California and lived with our mom for a few years. Currently, he is now in a sober group home where, as I also mentioned, they take good care of him. He goes to dual diagnosis meetings, twelve step meetings, and has made a lot of friends. While he was living with our mom, I began to find studies and articles that showed a correlation between teen pot use and adult mental illness. I found Moms Strong, The Other Side of Cannabis, and Smart Approaches to Marijuana. I was overwhelmed by what I was learning. The studies seemed to describe my brother’s life: from his inability to do well in his studies, to his addiction to pot that transferred seamlessly to cocaine, to his devastating mental illness. I asked K if he wanted to write something to warn other young people from making his same mistakes. He agreed. He said if he ever thought pot would make him go crazy he never would have tried it. In Los Angeles, our growing homeless population is often attributed to high property values and rents (which are absolutely too high in my opinion), but I wonder how many people are homeless due to the scourges of drug abuse? Of the homeless drug addicts, how many of them were smoking pot when they were young? And was pot their first drug of choice? My brother’s anecdotal observation is that everyone he’s met at Narcotics Anonymous meetings first started with marijuana. Not everyone who smokes pot will become psychotic, but it is not harmless. 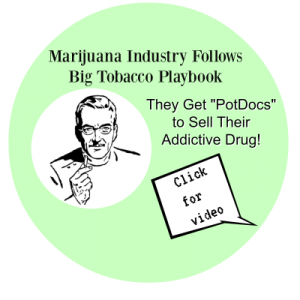 We have to warn our kids about the huge risks associated with teen marijuana use. There is far too much to lose. My brother will tell you so. Submitted by H.A. Swan of Southern California. H.A. 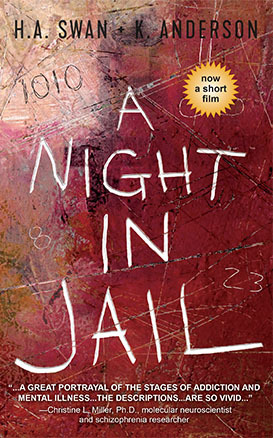 is co-author of the book, A NIGHT IN JAIL. It is equal parts fiction and nonfiction. It is written by H.A.Swan and K.Anderson. Available on Amazon. Thank you so much for sharing your story with Moms Strong. I read your book and can’t get it out of my head. It’s a brilliant way to look at the power of addiction, the power of pot. It punctuates the point that recovery from addiction can rarely if ever be accomplished by one. It takes two or more to crawl out of the whirlpool that is addiction. Weed seems to now be a powerful “super virus” infecting our society. What was once a naturally mild hallucinogenic substance has been morphed into a powerful high THC product, recovery resistant, causing overdoses and ruined lives. I wish I could buy this in paper form to share with my grandkids, with schools, with families trying to guide their adolescent children through the minefield of our drug normalized and commercialized world. Thank you for your work helping others. Thank you so so much for all of your kind words! The novella is absolutely available in paperback on Amazon. It is priced to be affordable to anyone who wants to read it. It is my great hope it is read by as many young people as possible. Your suggestion to have it read in schools is deeply appreciated. I wish the best to you and your family. Thank you Heidi! I have since bought a few and will be sharing them in places they will make a difference for young people. Thank you for what you have created. Thank you for joining our voices at Moms Strong. My brother and I feel it is crucial parents, schools, and kids understand how quickly things can go bad. I hope his story reaches more people. I saw your thoughtful review on Amazon–it helps me and my brother a lot!